A new traffic light at Sunbury Meadows Drive and state Route 3 in Sunbury will go into operation on June 13. 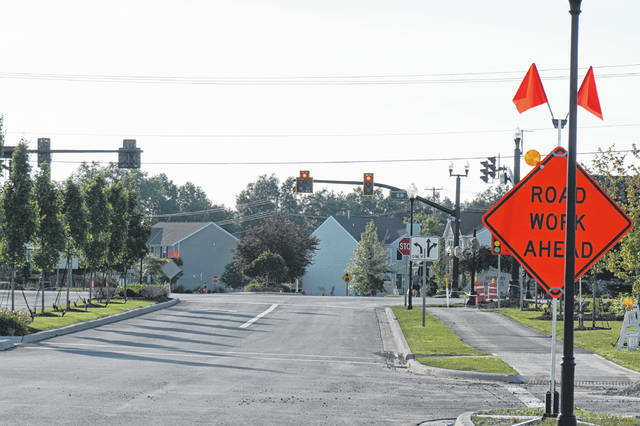 Sunbury Village Council said it liked a new traffic light and took steps to plan for a potential charter commission at its meeting on June 6. The traffic light, at Sunbury Meadows Drive and state Route 3, was installed last week, and if social media is any indication, residents in the area were pleased to see it. Drivers on Sunbury Meadows, on the southern edge of the village, have had to exercise caution when making a left turn onto state Route 3 to avoid oncoming traffic southbound and northbound. The long-awaited stoplight was to go in last year, but the pole manufacturer had gone out of business, and the order was cancelled. A new order was placed with another manufacturer and was expected to be delivered this fall. However, the project will be completed in advance. “I’m happy to report that next week at this time, the light will be up and running. That’s going to be a nice addition,” Village Administrator Allen Rothermel told council. Dustin Doherty, a representative of the engineering firm CT Consultants, said the light will go into operation a week after its installation, on June 13. Currently, it is flashing red and there are signs letting motorists know about the impending change. Accompanying the signal are new sidewalks, curb ramps, pedestrian countdown timers, intersection lighting and illuminated street signs. Also being added in the subdivision will be on-road markers reminding residents and other motorists that there are children playing and to slow down. The markers are in response to a resident’s concerns about vehicles speeding down the sloped Sunbury Meadows Drive. Just as the traffic signal represents a long-term solution for Sunbury, so is the idea of how the municipality will be governed after the village becomes a city following the results of the 2020 U.S. Census. Solicitor David Brehm told council that Sunbury currently operates as a statutory village, which requires a mayor, six-person council and an administrator. Once Sunbury’s population officially goes over 5,000 people, it would have to either be governed as a statutory city or according to a charter written by its own residents. However, the residents must decide on whether to have a charter, and a 15-resident charter commission must be established prior to the issue going on the ballot. The charter issue and potential commission members would be voted on in November 2018. In order to meet the Delaware County Board of Elections deadlines, the commission members must be selected by Aug. 22. Another member of the firm, Nick Gordon, said a 15-member charter commission cannot include the administrator or council members, but any other resident would be eligible. Hatfield said an open house soliciting charter commission members would take place by the end of July. In other business, council approved paying a number of bills, including the purchase of a new Kubota lawnmower from Evolution Ag.